I am sure every one of you has a story of a misconception about a word, that you learned as a kid. I was just thinking of one of my own stories a moment ago. (And this is just an off the cuff post--simply meant for laughing). It's amazing how a kid's imagination can give a whole new meaning or perception to something or someone. This is how I learned a new word, at age 11. I asked mom if I could get some books about Mozart. I was wanting to start studying the classic composers. (I liked to study different things--my curiosity knows no bounds). Mom: "I don't know about Mozart...maybe Beethoven. 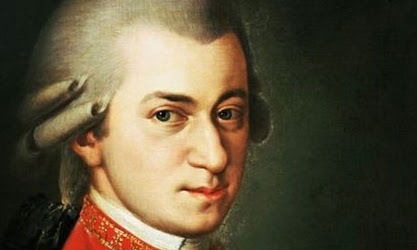 Mozart was a womanizer." New word! Blankly, me: "What's a womanizer?" Mom: "It's a man that chases women." "Oh." Silent thinking. I walk away, picturing a skinny wild man in a white wig chasing a horde of terrified women down the street. And I think, "Mozart must have been a horrible, crazy man." Oh, and by the way, reading about Beethoven...no different. The crazy man had a thing for married women, it really seems like. If you have a story to share, please tell me! I'd love to hear it!! P.S. Soon I'm going to be doing some specials for my shop, Transcendence Designs, so keep an eye out! My funny word stories involve mispronunciations. I did a lot of reading and not a lot of talking during school. I think my close friends just rolled with whatever came out of my mouth. During my senior year of high school, I worked in a publications class on the school newspaper and yearbook. I forget what I was reading out loud at the time, but I assume it was someone's newspaper article. I came across the word facade. I'd seen this word a million times in books and pronounced it just the way it was written. My classmate gave me this incredulous look and said, "You mean 'va-sa-odd'?" I didn't the issue. I had heard that word before too. I said "Don't they mean the same thing?" No, no TK, they do not. And that is how I learned how to pronounce the word facade. Be glad you didn't ask what hermaphroditic meant. That was me. Oh...so what does it mean? Oh, guess I'll have to do it the hard way and look it up. I have heard some of Vivaldi's music. Lovely!